Sadly, AC/DC’s lead singer, Bon Scott, “drunk himself to death” according to the coroner’s report. 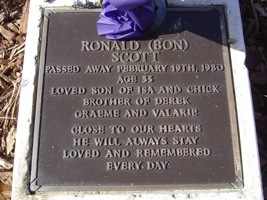 Scott was found dead in his car after an indulgent binge left his body lifeless and his soul at the end of the “Highway to Hell,” which Bon Scott sang about prior to his death. Scott violently choked to death on his own vomit. 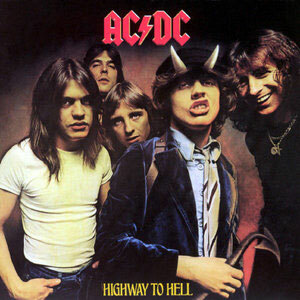 AC/DC’s philosophy and music not only drove Bon Scott to a premature death, but the U.S. Army used AC/DC’s music as “psychological torture” to drive Manuel Noriega out of the Vatican Embassy and into prison. Sadly, millions of AC/DC fans have voluntarily ingested the same poison that was forced on Noriega and killed Bon Scott, facilitating his highway to hell. Thank God He has made a narrow road which leads to eternal life and heaven for those who prefer to have eternal joy with their creator, rather than eternal torment (Matthew 7:13-14, John 14:6).